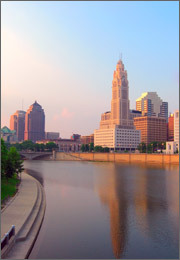 Columbus is Ohio’s capital city, as well as its most populous. Hundreds of places throughout the Americas, including Columbus, British Columbia, the District of Columbia, Colon, Colombo, etc., are named after explorer Christopher Columbus. The city’s economy centers on technology, insurance, and healthcare. Columbus has a population of close to a million. Large insurance and healthcare companies call Columbus home. These industries provide ample employment opportunities for the city’s burgeoning number of lawyers. The Columbus Bar Association alone boasts over 8,000 attorney members. With so many Columbus lawyers to choose from, how does one go about identifying and contacting a talented and ethical lawyer interested in one’s case? LegalMatch.com is a free legal matching service, connecting clients with the right Columbus lawyer for their case. Simply input your case information, and you are matched with pre-screened Columbus attorneys ready to help. Columbus lawyers specialize in every possible legal area, including insurance law, healthcare law, bankruptcy law, divorce law, criminal law, and personal injury law. In a recent lawsuit, Columbus School District agreed to settle for $350,000, where school officials failed to notify police of a sexual assault of a developmentally impaired student occurring in the gymnasium. The 2 male students pleaded guilty in juvenile court to felonious assault. The principal was fired for not calling 911, and 3 vice-principals were demoted. Columbus lawyers are familiar with the regulations and procedures of the Franklin County Court of Common Pleas. This court has various divisions, including: civil law, criminal law, appeals law, domestic relations, juvenile law, and traffic. You may not be prepared to discuss your case with a Columbus lawyer at the present time. If your lawsuit is in its beginning stages, you can browse the useful information at LegalMatch’s Law Library, with over 3000 legal articles. Alternatively, pose your legal questions at LegalMatch’s Consumer-Lawyer Forum for free advice.